Kaiju Daiko is a monster taiko group from Chicago IL. Kaiju endeavors to share a dynamic form of drumming and to break down racial stereotypes. Members of Kaiju Daiko have studied Japanese Taiko drumming in Japan and the United States with: Yoshikazu Fujimoto, Eichi Saito, Leonard Eto, Miyauchi Sensei, Grand Master Seiichi Tanaka, Shoji Kameda, Master Ukichi Takano, Moko Igarashi, and Aka Oni Daiko. 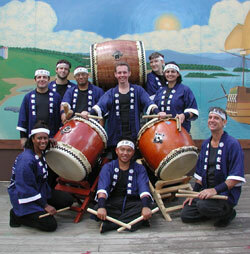 Kaiju Daiko offers performances and workshops for people of all ages. Past clients and performances include: American Airlines, Chicago Department of Cultural Affairs, Sears Corporation, Harold Washington College, Takeda Pharmaceuticals, Loyola, Concert of Colors, Bristol Renaissance Faire, Mensa, University, Beverly Art Center, Chicago Park District, Field Museum of Natural History, Nike, Millennium Park and the Midwest Drum and Dance Festival. Kaiju Daiko current members are: Nikolai Delov, Kim DeVore, Kimsour Eap, Evgenia Moropolous, Miwa Shimokogawa, and John Yost. Stay posted for upcoming shows on our Facebook page!